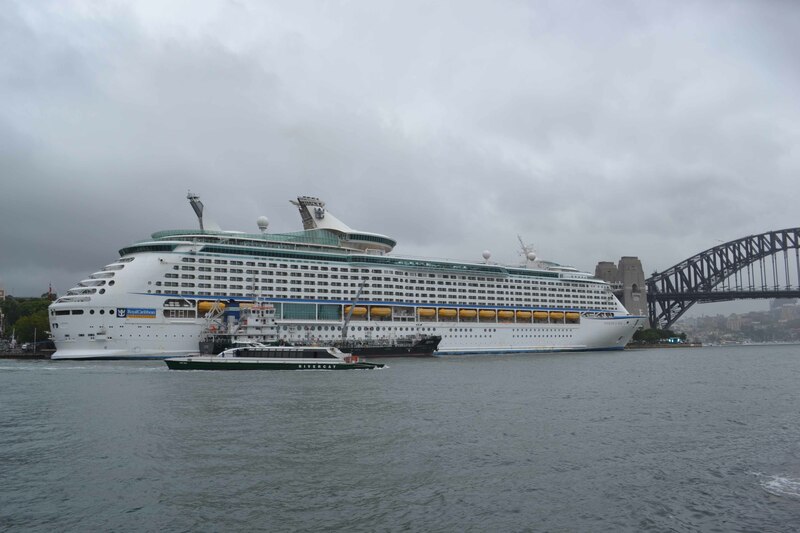 As we the scale of the Voyager of the Seas towered over us, my thoughts turned to my ancestors and their long voyage to Australia. While we anticipated being internet-less for a couple of days at a time it was inconceivable to think how they would have felt, standing on the dock with their life’s possessions, venturing into the unknown. They’d have known the chances of seeing their families was virtually non-existent rather than the brief hiatus in our communications. Each of us on the Unlock the Past Cruise is able to travel with all mod cons and tech toys, and to a large extent our own space. We were not cramped together in a confined space below decks, cheek by jowl with people we’d never met before, and not for nine days, but for upwards of ninety days. As the ocean turned on the waves after venturing through the heads, we were given a sample taste of what they might have experienced. Even with modern day stabilisers our floating palace was creaking and swaying. Just hearing the walls move in the night, and hearing the wind, brought my Mary O’Brien to my mind. Imagine the sound of sails flapping in the wind, timbers creaking, and sailors calling to each other. It must have been incredibly overwhelming for people who’d never left home before. Our ancestors were brave souls indeed to take that long journey to a hopefully better life. 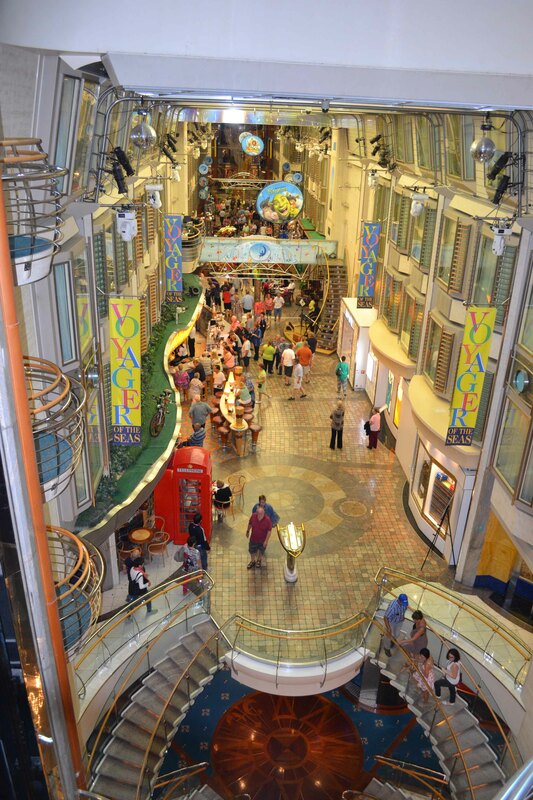 I took the time after boarding to roam the ship and check out its facilities…it’s rather like being on a mall at sea, without that many shops. Despite the full capacity of the ship (about 3000 pax) it never feels crowded as there are so many places for people to disperse. It’s all very bling-y with chandeliers in the dining room and Greek statues round the pool(s). Intriguing to see the bridge with all the captain’s super-speccy tech toys! 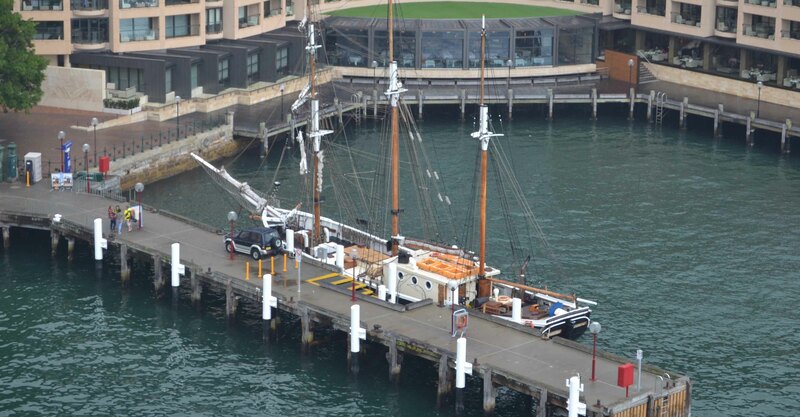 Sydney let us down with our sailout – grey raining and a wind that could have carried us to Melbourne. However it certainly gave a bird’s eye view of the Opera House! I enjoyed seeing the juxtaposition of Sydney’s old buildings and new. Sharn White, Thomas MacEntee and Jill Ball at the Meet and Greet. After dinner the genea-cruisers had our first get-together with the meet and greet in Cleopatra’s Needle. Much fun greeting each other and having photos taken in groups….two of us nearly got caught out putting our hands up as a total reflex when they called for the Queenslanders! Even more amusing was seeing everyone trying to stand straight as the ship moved….we really hadn’t been hitting the bars beforehand. All in all a fun day with new experiences and a day of learning adventures ahead in Day 2 as the conference proper kicks off. 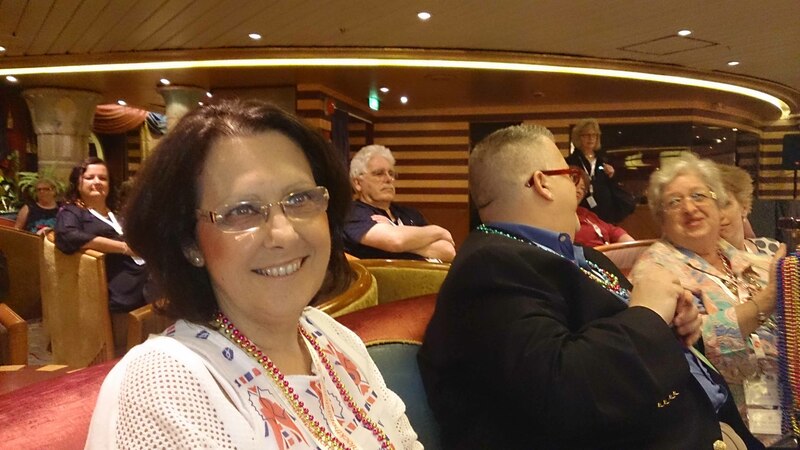 This entry was posted in Family History and tagged 4th Unlock the Past Cruise, Geneacruising by cassmob. Bookmark the permalink. What a wonderful, atmospheric post! I love the contrast of a modern, high-tech voyage with our ancestors’, free or transported. Have a great time (I have a feeling you will). I’m looking forward to more of your posts. Thanks Frances. I’ve had a great time and met some lovely people! Not to mention real-life meeting of geneabloggers. Thanks Pauleen. I’m loving reading posts about the cruise as I have quite a few cousins on board and another even ducked down to Melbourne from Ballarat for lunch at the Port with the cruising ones! Wish I could have too. Lots of people have been meeting up with family and friends along the way. I imagine you’re getting the news from your cousins too. I really enjoyed that you put your voyage in context. Our ancestors must have endured many unpleasant rainy days on their journeys to Australia. Thank goodness they did travel here and now we enjoy the benefits of that legacy. Enjoy the rest of the cruise. Thanks Carmel. I agree that they left us a wonderful legacy…such courage. Wish I was there. it is great that we can get updates. I’ve really enjoyed myself Sharon so I think I’ve broken the hex of my “don’t do cruises”. But then there’s so many fellow obsessives on board. Didn’t find you on the megaship today but found your blog post! I guess our ancestors would have been able to find us more easily. Pauleen, Once again you have written and expressive and topical post. Yes, our ancestors would have experienced a much different post. Thanks Jill…I think our ancestors would have been grateful for any time away from the crowded space. Funny to think of Mary O’Brien Kunkel maybe being here before me.